Belton Instructional Technology - This site has a page dedicated to the Common Core with lessons, activities, videos, and resources. Buck Institute for Education - the leading site to learn more about Project Based Learning. Resources galore, how to's, you name it, are on this excellent site. Common Core - An extensive collection of curriculum maps in ELA for all grade levels. Membership cost is minimal considering the wealth of resources offered. Math maps have just been released. Common Core State Standards Initiative - the definitive place to go for access to the CCSS. Edutopia - This site is dedicated to transforming the learning process by helping educators implement the strategies of project-based learning, assessment, teacher development and technology integration. Free Technology for Teachers - by Richard Byrne. The purpose of this site is to share information about free resources that teachers can use in their classrooms. Larry Ferlazzo's Websites of the Day - Larry's site features websites to help teachers in ELL, ESL and EFL classrooms, but all teachers can benefit. Next Vista for Learning - by Rushton Hurley. Next Vista provides a free library of videos made by and for teachers and students everywhere. Partnership for 21st Century Skills - Provide tools and resources to help the U.S. education system keep up by fusing the 3Rs and 4Cs (Critical thinking and problem solving, Communication, Collaboration, and Creativity and innovation). the Journal - Dedicated to informing and educating K-12 senior-level district and school administrators, technologists, and tech-savvy educators within districts, schools, and classrooms to improve and advance the learning process through the use of technology. A recent the Journal article on Tablet Management issues, including some thoughts by Gene Tognetti. Working At The Edge - by Randy Ziegenfuss. A collection of resources for the contemporary educator. Please consider adding the nonprofit site www.BigFunEducation.org. Our BIG Plays series are full of Common Core activities. Please look into adding Glean to this list. 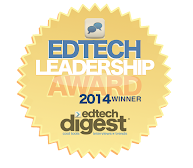 (www.glean.co) Wonderful ed videos site with an adaptive learning component. Easy, free, and fun for students and teachers!